The action-packed comedy film "Project X" began shooting on June 19 during the 21st Shanghai International Film Festival. 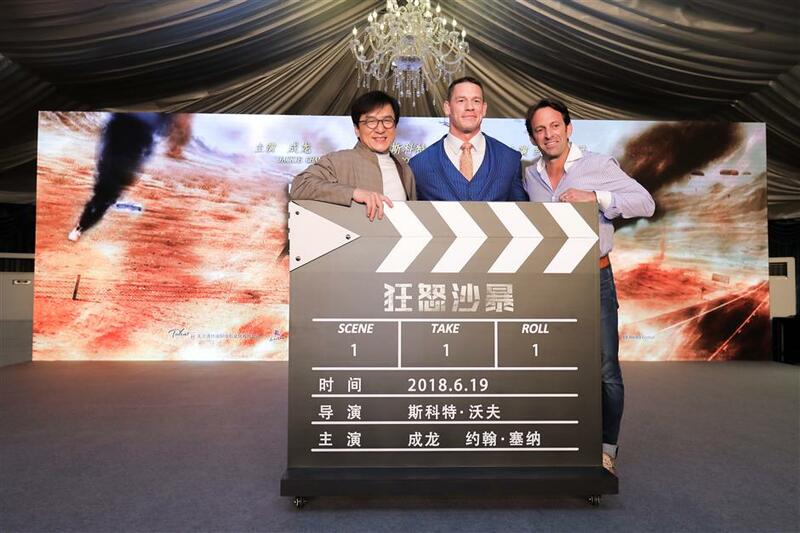 Kung fu actor Jackie Chan (left), WWE celebrity John Cena and director of the film, Scott Waugh, pose for a photo. Directed by Hollywood filmmaker Scott Waugh, the film stars famous kung fu actor Jackie Chan and WWE (World Wrestling Entertainment) celebrity John Cena. Set in a desert in the Middle East, the film tells the story of a retired Chinese soldier and an American mercenary who get to know each other as they fight for the same goal. Director Scott Waugh, best known for "Need for Speed," is fascinated with the scenery and culture of China. He is excited about making a film that blends Oriental and Western cultures together. Jackie Chan said that although it is tough to shoot a film in the desert, he has some tips to share because of his former desert acting experiences in such movies as "Project Eagle" and "Dragon Blade." Cena, who can speak fluent Chinese, told Chan that he grew up watching many of his movies. The two stars will display their skills in kung fu, combat and wrestling for audiences. The film is slated for release in 2019.